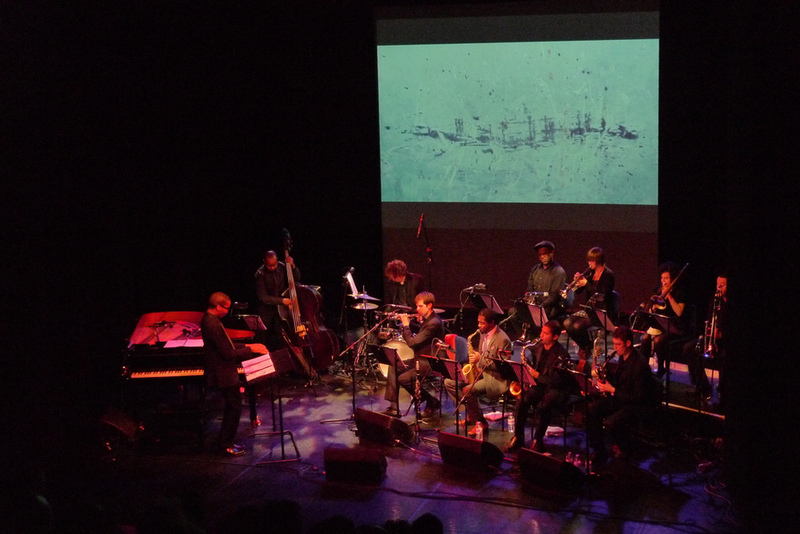 At Lakeside Arts Centre, an 11-piece ensemble from the Nu Civilisation Orchestra – including original Tomorrow’s Warriors trumpeter Byron Wallen – premiered a set of simply sublime music by Jamaican free form jazz genius, Joe Harriott specially orchestrated by Musical Director, Peter Edwards and including four new pieces created by Peter as part of the Lively Up! Festival commission. The orchestra was set in the space against a backdrop of fascinating stop-start film footage of visual artist, Emma Godebska creating the extraordinary pictures commissioned as part of the collaboration with Peter and the orchestra. The finished art works were hung in the gallery space where Emma made herself available to discuss her work. The short video here is a sneak peak on one of the orchestra’s early rehearsals for this project: Parallel – Where Music Meets Art. It’s wonderful to see Tomorrow’s Warriors alumnus and Musical Director, Peter Edwards growing in stature and confidence as he conducts what must surely be one of the UK’s top jazz orchestras. This entry was posted in Artists 2012, Blog, Lively Up 2012, Programmes 2012 and tagged Byron Wallen, Emma Godebska, Joe Harriott, Lakeside Arts Centre, Lively Up Festival, Nu Civilisation Orchestra, Parallel, Peter Edwards, Tomorrow's Warriors on Wed 10 Oct 2012 by tomorrowswarriors.